Investigators with Hagerstown Police Department, Washington County Sheriff’s Office, Frederick County (MD) Sheriff’s Office and Montgomery County Police Department are attempting to identify a suspect in several thefts and related cases of credit card fraud that have occurred in Hagerstown, Frederick, Jefferson, Gaithersburg and Rockville, between March and October 2017. In most cases, stolen credit cards were used shortly after the victim’s wallet was stolen from a gym locker or a business’s employee break room or back office. On several occasions, the suspect committed thefts while under the pretense of looking for a restroom. 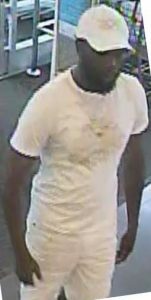 The suspect is described as a black male, 25 – 35 years-of-age, 5’ 8” – 5’ 10’, 150 – 165 lbs., with full beard and mustache, often wearing athletic or casual attire, including a baseball style hat. Employees of fitness centers and retail businesses are asked to be on alert for this subject and contact local law enforcement immediately if he is encountered. Anyone with information on the suspect’s identity may contact Det. Monn, with the Washington County Sheriff’s Office at 240-313-2186.